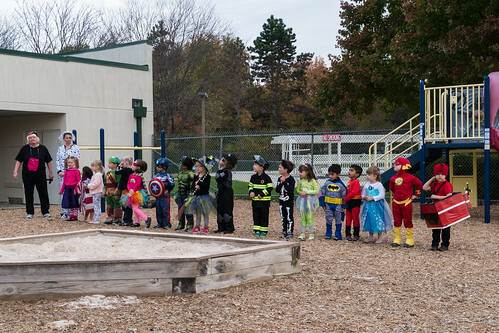 Leah had her class Halloween party, which included the traditional singing in costume for all the parents to watch. She did great. 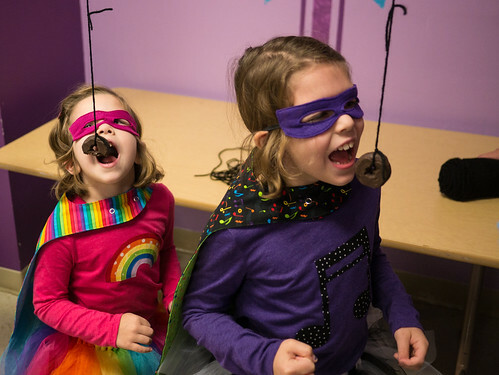 Lots of superheroes in the class, including several from comics and a couple (like Leah) of their own invention. And, of course, one Swedish pop star, as you’d expect in a preschool class. 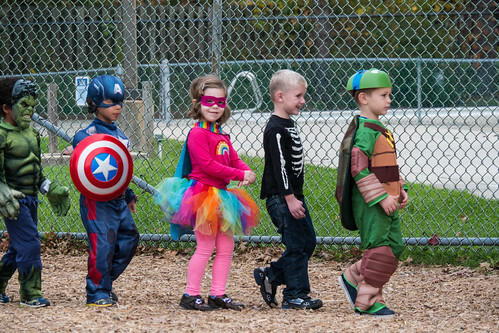 Molly’s school had a costume parade for the parents as well. 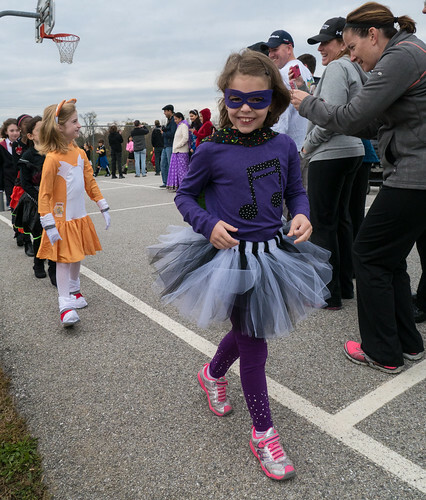 A huge sea of parents showed up for a very quick parade. I had to be fast to get a picture of Molly before she blew by. And they’re gone, with only capes and tails in view. 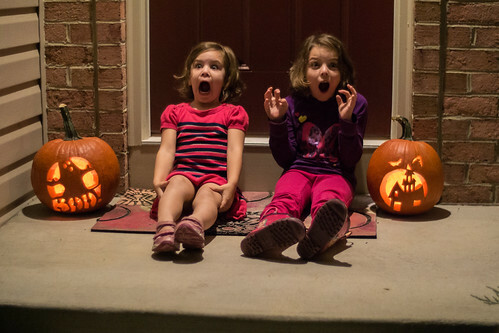 We finally got around to buying a couple of pumpkins to carve. 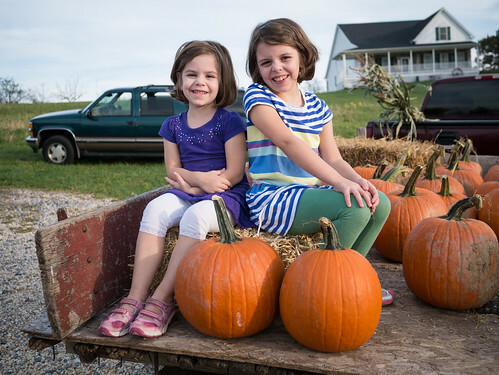 We got them from the Baugher Farm stand right near our house. These two were perfect choices. 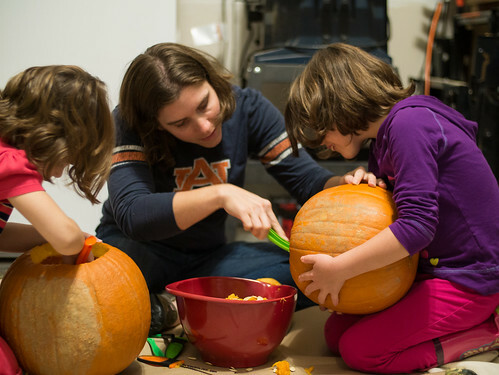 Time to carve the pumpkins. But first, let’s scoop some goop out. Molly looks like she might just take a bite. OK, maybe not. 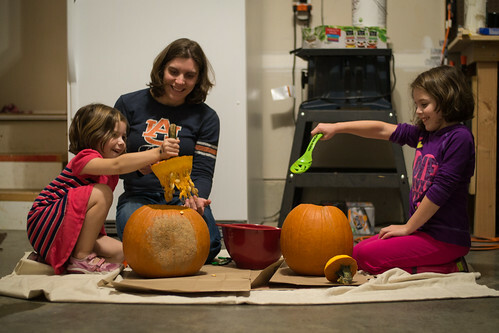 They needed some help getting the last bits out of the pumpkin. Mom to the rescue. 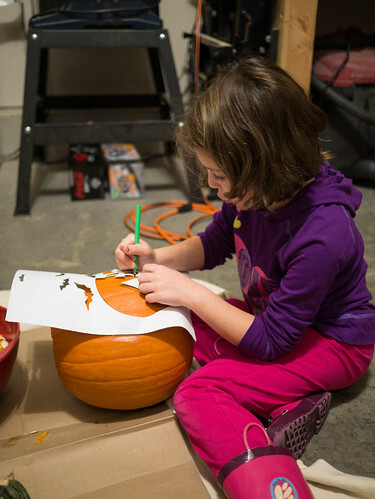 Molly selected her pattern and drew on the design herself this year, then Jen did the carving. I drew on the pattern Leah selected and then carved it. 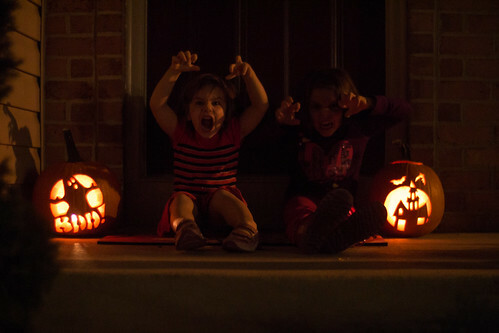 Here are some scary girls with their finished glowing pumpkins. With the lights off, the girls are scary, but with the lights on they’re just scared. 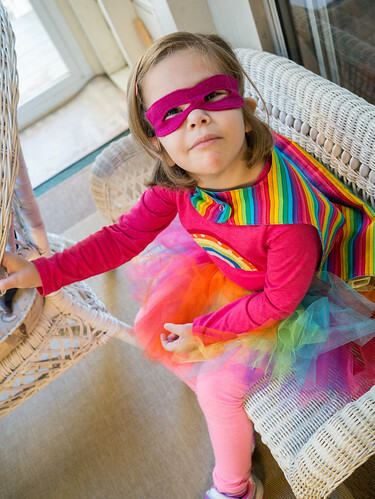 Ever since Halloween last year, we’ve had an ongoing conversation about costumes for this year. 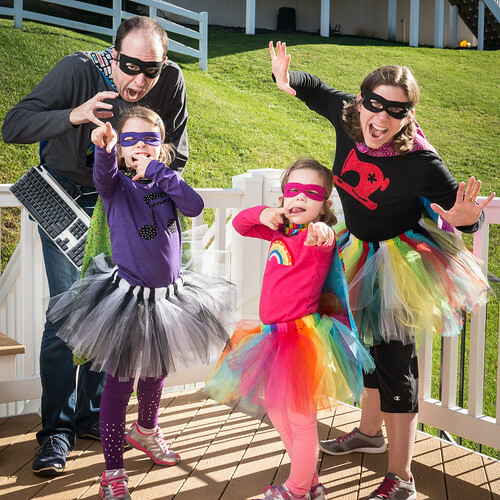 We all wanted to do a family costume and Jen was ready for a break from princesses after the last three years. Jen and I pushed for more creative costumes (e.g. a lunch box, sandwich, juice box, etc.) while the girls wanted something more common. 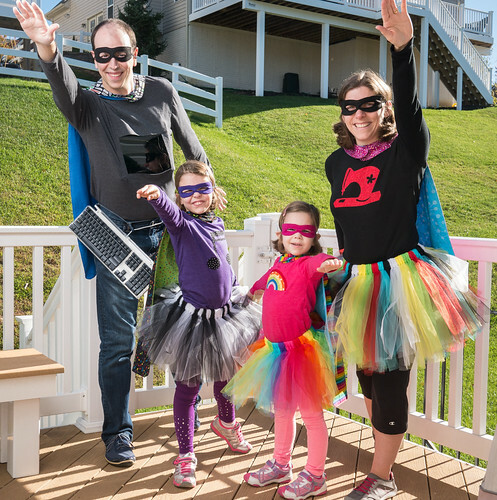 In the end, they really wanted to be superheroes, so we decided to make up superheroes of our own. 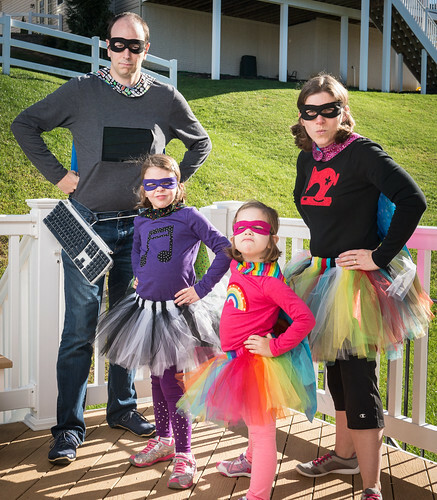 From left to right - the Caped Computer Crusader, Music Molly, Rainbow Girl, and the Super Seamstress. 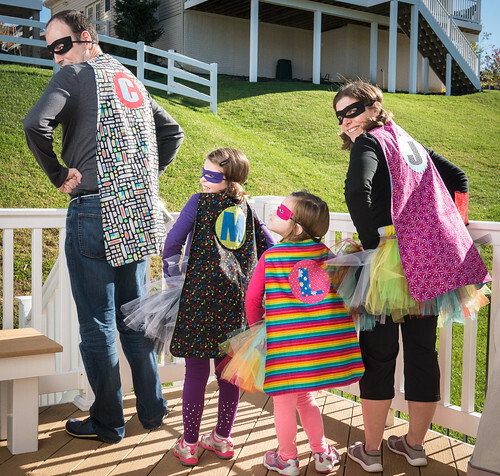 Together we are the Super Sellers. 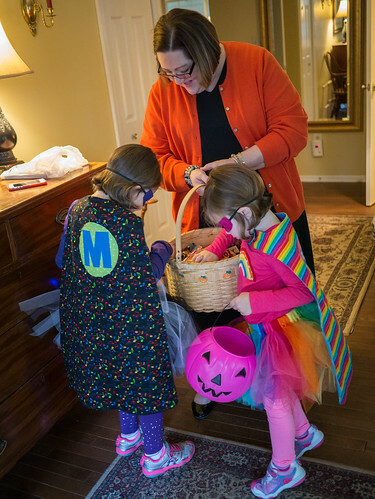 Since Halloween day was going to be very busy and Aunt Caroline would not be home early enough to see the girls then, we decided to trick-or-treat at Grams’s house a few days early. We were already getting dressed up to go to Trunk-or-Treat at church, so Sunday made a good time to visit Grams as well. We wanted to get a few pictures with the girls, but Leah decided to be stubborn and refused to take them. Eventually she came around. 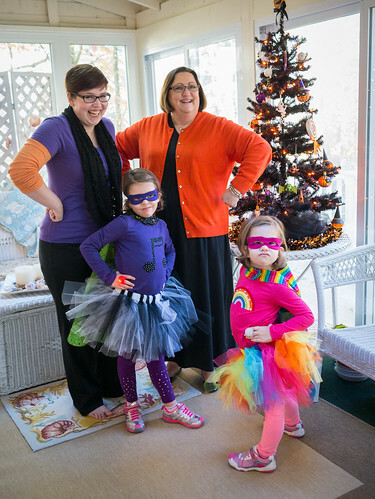 The girls are superheroes, while Aunt Caroline and Grams maintain their secret identities. 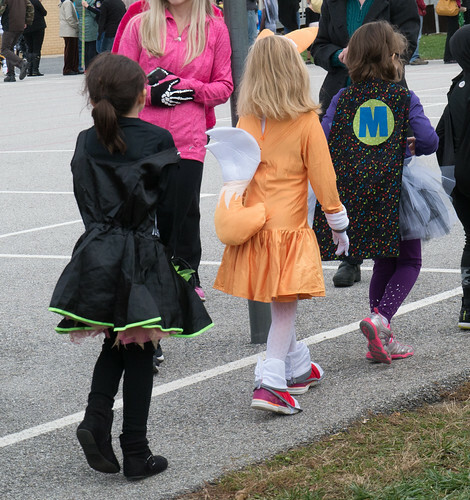 Before arriving at the Trunk-or-Treat festivities at church, we already knew where the girls wanted to go first - the donut swing. 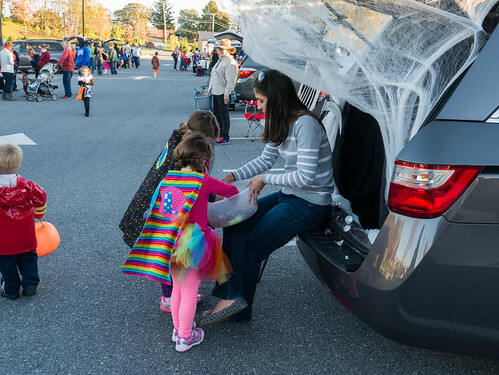 After some indoor fun, we headed outside to trunk-or-treat. 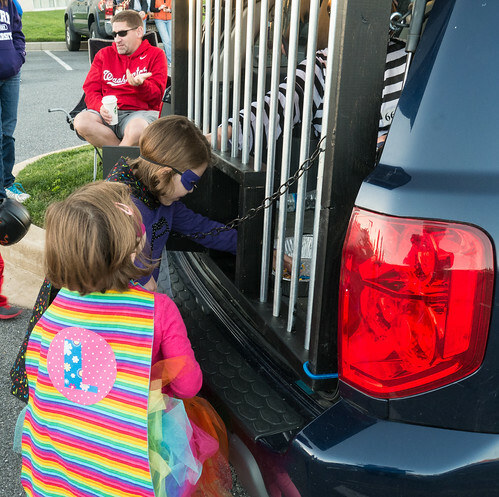 This car was our favorite - a prison cell with a little door to reach through for candy. 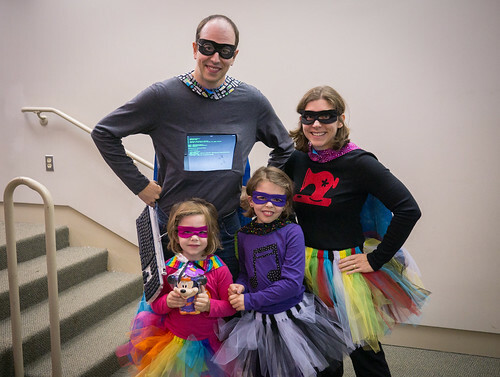 The girls were very excited about the costume competition, and even more excited when we won for best family costume (the Minnie Mouse jar full of candy was the prize). 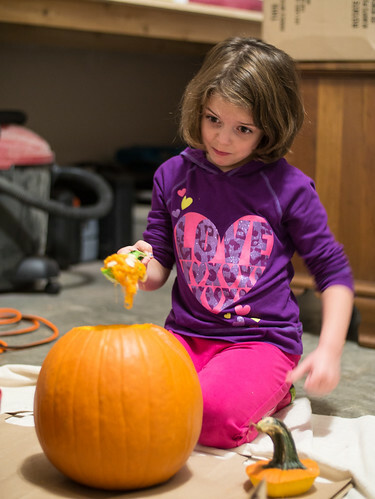 All that, and Halloween was still 5 days away. Lots more fun to be had before then. 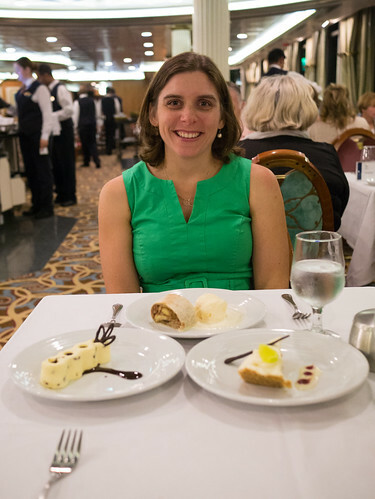 There were several dining options on the ship, but we tried to go to the main dining room as much as possible (every dinner, most breakfast and lunch). It was like going to a fancy restaurant with impeccable service for every meal, and ordering whatever you wanted. This shot is from our last night’s dessert, and includes apple strudel, key lime pie, and pear mousse with chocolate chips and chocolate sauce. We had the same dinner servers every night but one. Andy from Indonesia (right) was our waiter and Rosalio from the Philippines (left) was our assistant waiter. They were fantastic, and I hold Andy personally responsible for any weight I gained. He just kept pushing more food on us. For example, one night I ordered the prime rib (excellent), and he took it upon himself to order an extra lobster tail and shrimp entree so he could give me lobster and shrimp “on the side” of it. I frequently ended up with two appetizers, two entrees, and two desserts. 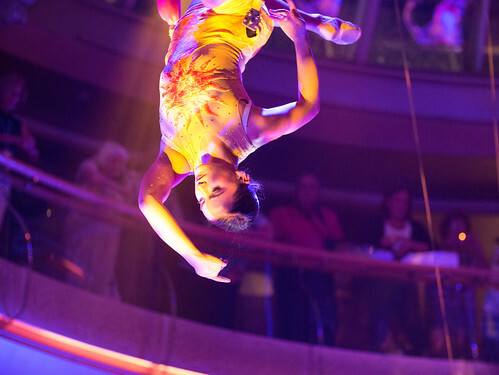 We saw lots of shows on the ship, but I didn’t photograph many of them. I did get a shot of an aerial performance from the last night. 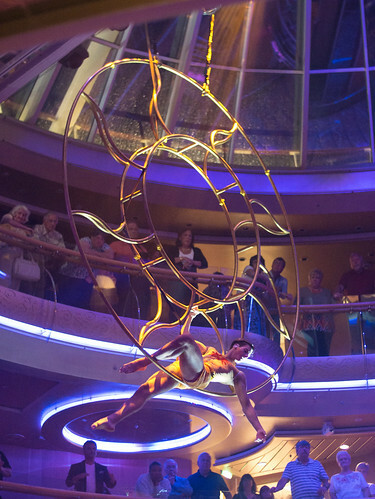 This was done in the Centrum, a central atrium reaching from deck 4 up to deck 8. It started off seeming like a cool show, but after the first song finished there was no second song. The entire show was only 6 minutes long. Here’s another of the aerial performers. All in all, the cruise was a great time for Jen and I to get away together. That said, I don’t think we’ll be going on another cruise any time soon for two main reasons. First, we both had motion sickness problems and side effects from treatments for those problems. Secondly, we didn’t get to really see Bermuda. In the future, I think we’ll choose to fly to our destination so we get more time there to do the things we want to do there. That said, I’ll miss the dining room on the ship. 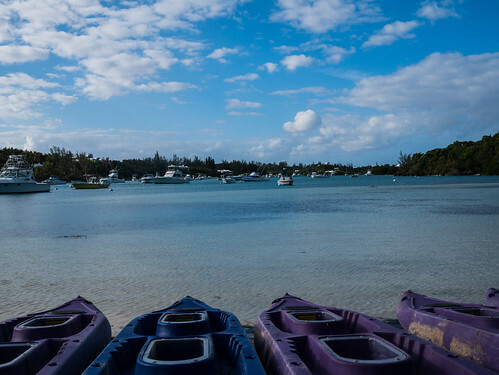 Our last day in Bermuda we got up early to go kayaking. I took advantage of being up early to get a shot of the sun coming up over the Great Sound. We hopped on a boat and got a bit of a tour before arriving at our destination for kayaking. They were glass-bottom kayaks, which turned out to be a gimmick. You don’t need a window in the bottom of a kayak because you can see down all around you. Tropical Storm Fay did a lot of damage. We saw a bunch of wrecked boats like this one as we paddled around. 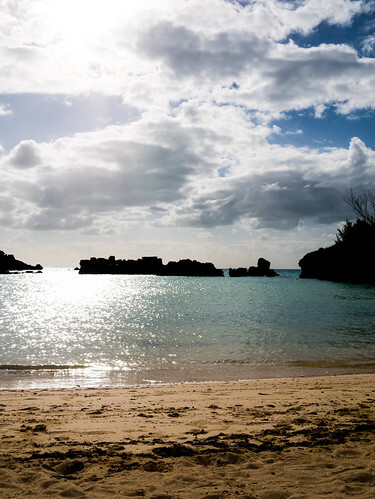 As if that wasn’t enough, Bermuda got hit by a much bigger hurricane less than a week later. Thankfully, we were home by then. 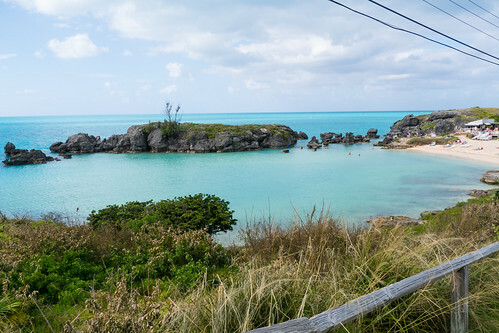 We hope Bermuda can get a break for a while to recover. 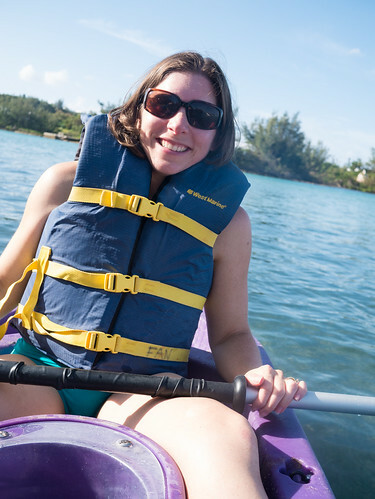 Here’s Jen in the back of our kayak. We didn’t see too much sea life, but we did see a couple of sea turtles swim by us. Most of the time, though, we were just covering a lot of water. It was a really good workout, which was fun but not what we expected. We got someone to take a picture of us, but it came out blurry thanks to all the water covering the lens. Sorry about that. 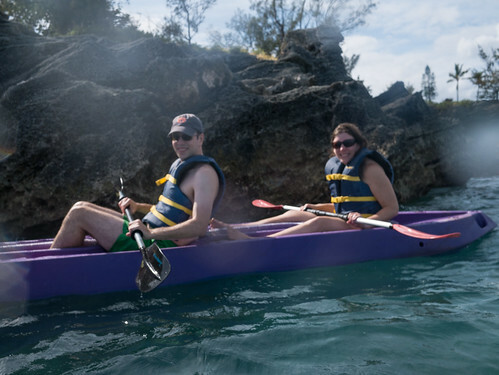 Our kayak tour ran long, meaning we were running late to get back to the cruise ship before it departed Bermuda. So, our boat ride back was at top speed. 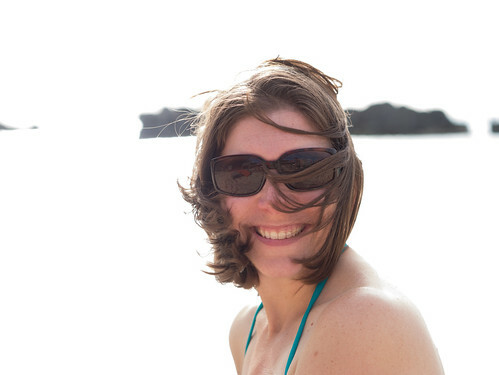 Jen got a little wind-blown. That afternoon we took a bit of a nap and relaxed after the early and exhausting morning. 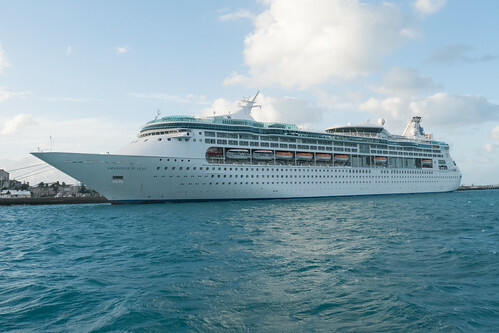 Fortunately, a cruise ship is a great place to relax (as long as it isn’t rocking too much). Since we didn’t get on the tour, we made one of our own. For the morning, we wandered around the Royal Navy Dockyard area. Here’s Jen in front of the historic Commissioner’s house. In the afternoon, we thought we’d check out the part of the Hidden Gems tour we were most excited about - Tom Moore’s Jungle. So, we hopped on a ferry to head out to St. George’s, then we hopped on a bus to get to the trail head. We rode one bus for a while, then hopped off to catch the bus that would take us where we wanted to go. We waited, and waited. Eventually, we asked a different bus driver where the bus we wanted was, and she said it was not running because the road we needed to go down was closed due to fallen trees from the storm. So, after wasting several hours, we hopped on a bus to go back to St. George’s and find a beach. 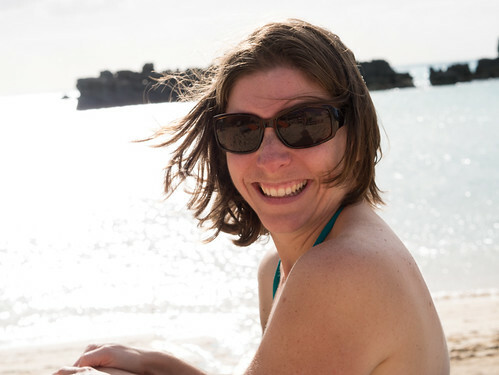 After a 20 minute walk, we finally managed to find a beach to relax on - Tobacco Bay beach. It’s a tiny beach on some water that’s protected by rocks, keeping it very calm. A perfect place for people (and fish) to swim. 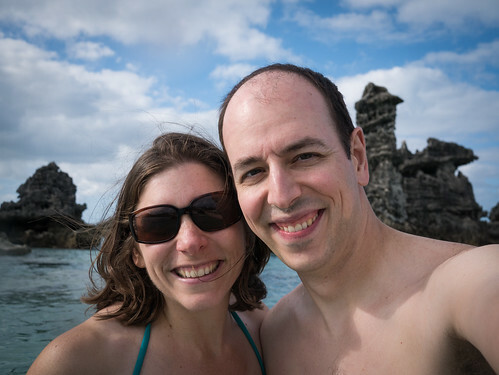 A quick selfie of the two of us as we waded around the water. 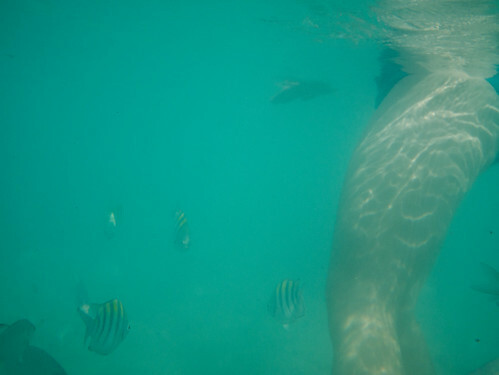 Jen was befriended by a bunch of fish as she waded into the water. 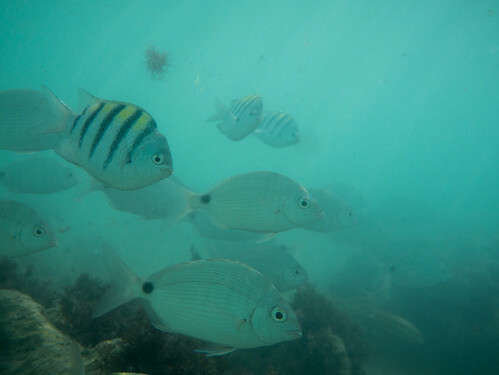 There really were a lot of fish around. This came from me just sticking my camera in the water and clicking. They clearly weren’t afraid of us. 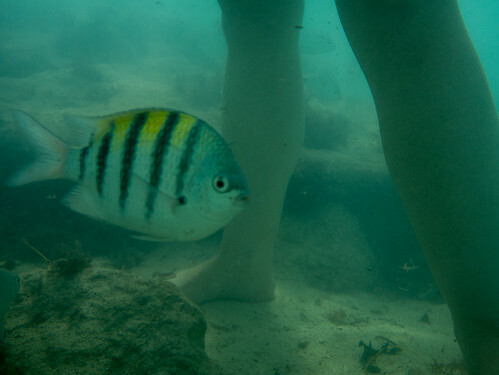 This fish gave me a dirty look when I tried to take a picture of it by Jen’s legs. It was serene looking out from the beach as the sun started to go down. It’s really nice as a photographer to be married to such a gorgeous model. She’s too beautiful for me to pick just one of these. I had to show you two. On the ferry ride back to the dockyard, I got another picture of our cruise ship. This one’s from the other side and a bit farther away to give a better perspective. 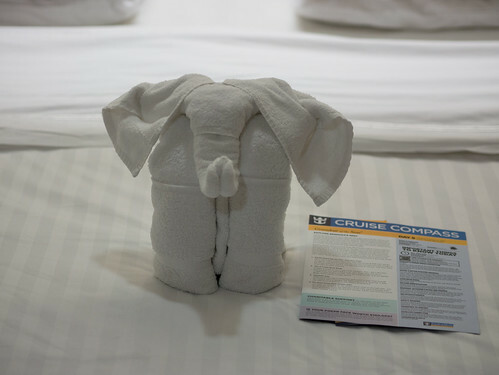 And to close out the busy day, we got a new towel animal - an elephant. Things took a turn for the worse during our second night on board. Tropical Storm Fay (soon to become Hurricane Fay) was headed right for Bermuda a little ahead of us. While we didn’t sail through the storm, it did mean we had 10-15 foot waves tossing our ship around. We woke up Sunday morning to this and headed to breakfast. The dining room was crazy, as the carts of food kept rolling around and toppling over. 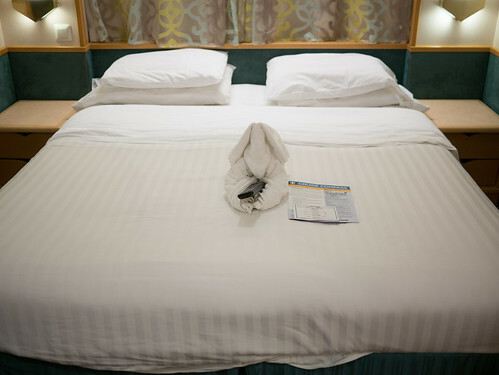 There were barf bags strategically placed all over the ship. Jen’s Zumba class was cancelled. I was feeling queasy, so I headed to our room to lie down. Jen said she felt OK, so she went to the fitness center. She tried the elliptical machine, but it was too crazy with the boat rocking. She tried the treadmill, but she could see the ocean which made her queasy too. So she headed down to the room to lie down as well. She lasted about 10 minutes before she lost her breakfast. We then spent much of the day lying down in our room (though we did leave to get a light lunch around noon). We probably napped for 4 hours that day, but it wasn’t peaceful sleeping. Later in the afternoon things started to calm down. We were originally supposed to get into Bermuda at 3:00 that afternoon, but they closed the port due to the storm. We did end up getting into port around 6:00. 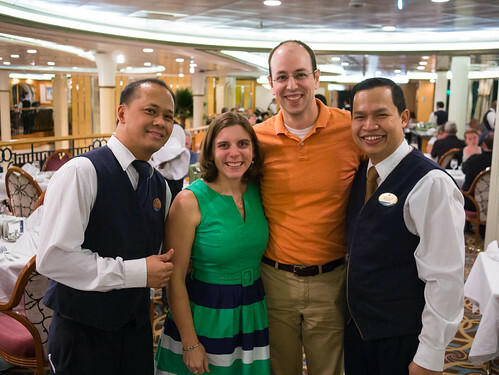 We were scheduled to eat dinner on the ship at 7:00, so we didn’t really have any time to do anything that day. 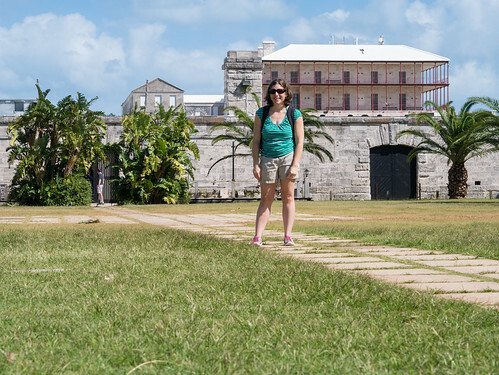 We did hop off the ship both to set foot on solid ground and to technically be in Bermuda. 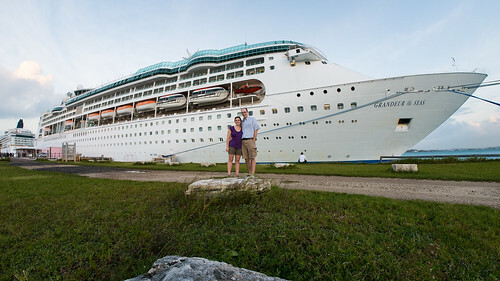 We took advantage of the opportunity to get a picture with our ship. We were only off the ship for about 15 minutes, but it felt good none-the-less. We were happy we didn’t have anything else scheduled that day, as all excursions had been cancelled due to storm damage. 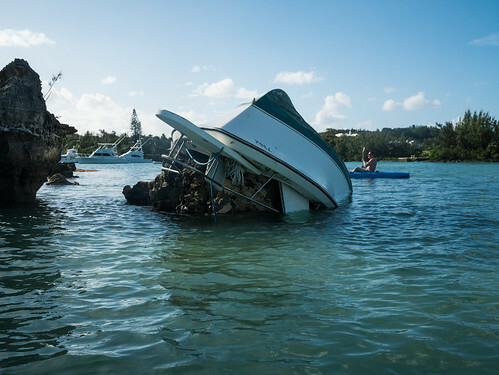 Bermuda got hit very hard by the storm, which we’d learn about more as our stay continued. Our second day on the cruise went very well. We got up early so Jen could take a Zumba class on the pool deck. We played some cards. I played in the Adult Table Tennis Tournament and took home the bronze medal (they did actually give out medals). And all along our sea sickness patches kept working. That night was a formal night, and also the night assigned to be our anniversary celebration. The wait staff sang to us and brought us an extra dessert with a candle. It was lots of fun. Here we are after dinner. Excuse our odd color from all the neon lights around us. We then went to the big show of the night - a Motown group that sang lots of fun old songs. Our room steward would sometimes leave us these fun towel animals after he made the room up for the evening. I believe this is a floppy-eared dog. 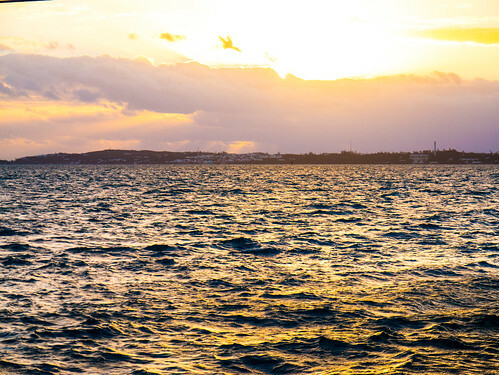 Our second day at sea was a good one, and we were looking forward to getting to Bermuda the next afternoon. Jen and I did not take our usual anniversary trip last year due to the move. So, this year we decided to make our trip a big one. 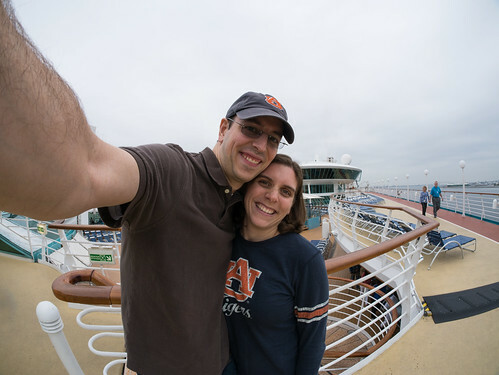 We decided to go on a cruise for the first time. Here we are atop the Royal Caribbean Grandeur of the Seas ready to leave the port of Baltimore and head to Bermuda. 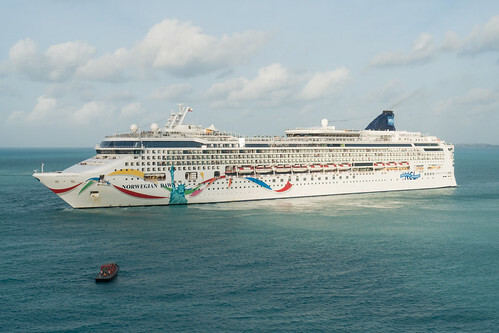 It’s a six night cruise, with a couple days at sea, a couple days in Bermuda, and a couple days at sea to get home. 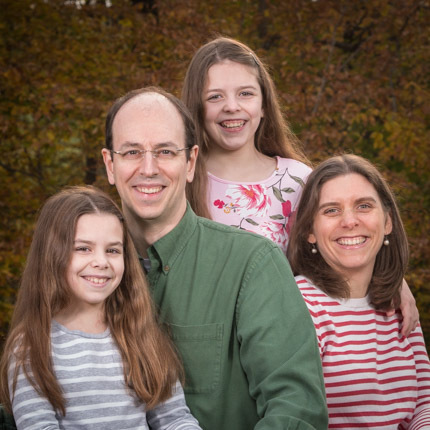 Note that there are no kids in this picture - the girls stayed with Grams while we got away (thanks again Grams!). 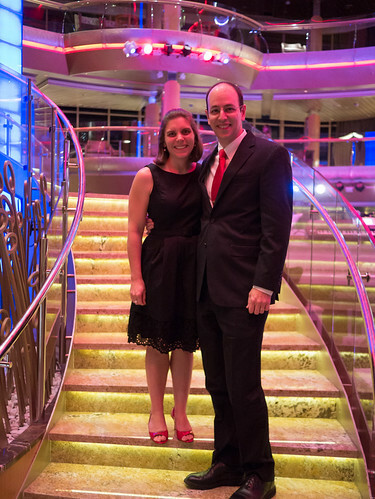 This was my first cruise, and Jen’s first since she was a preteen. So, we don’t have a lot of experience with cruise ships. That said, the ship had a lot to offer. 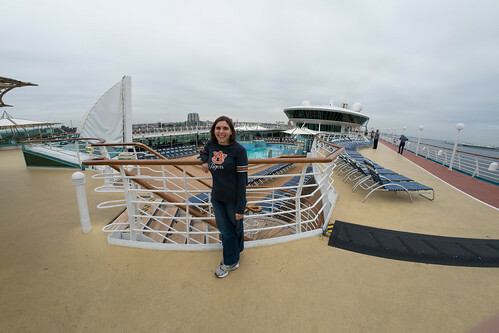 Here’s Jen on deck 10, overlooking the main pool on deck 9. The ship had a second pool with a retractable glass roof called the Solarium. This pool was adults-only, making it a nice calm place to relax. 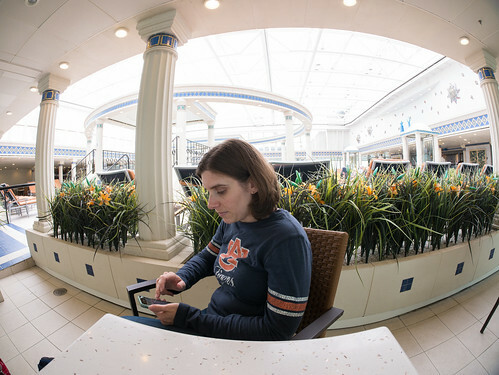 Jen’s checking her email with the last bit of connectivity before we left port. 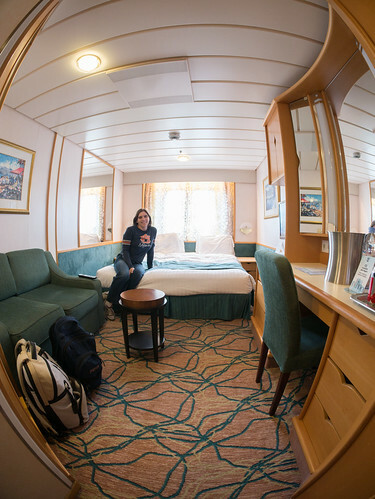 Our stateroom was tiny. I had to use my fisheye ultra-wide angle lens to get a picture of it. But its size didn’t bother us. The tiny bathroom was a bit more challenging (think airplane bathroom with a shower the size of a garbage can tacked on). A couple hours after we left port, we both started feeling the effects of the motion. Fortunately, Jen had gotten four sea sickness scopolamine patches from her doctor, each lasting three days. That meant she had enough for the both of us. So, we both stuck them on, and they helped a lot with the motion sickness. 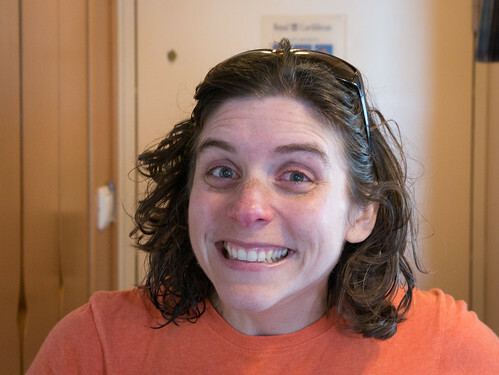 Unfortunately, we also got many of the side effects (dry mouth, blurry vision and dilated pupils, and bloodshot eyes), but that was better than feeling sick. 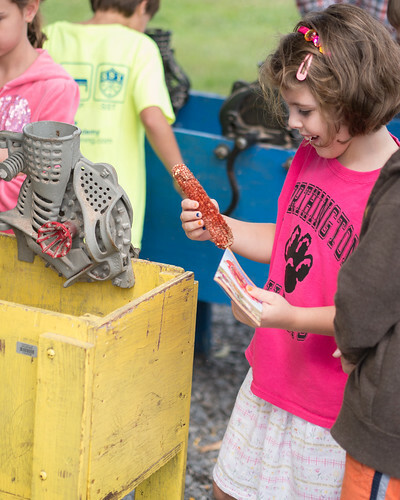 Molly’s class took their first field trip of second grade to the Howard County Antique Farm Machinery Club’s Howard County Living Farm Heritage Museum. It’s a non-functioning farm that they use to teach about what it was like on a farm before electricity. I went along. Our first stop was the blacksmith, who made a mini horseshoe for us. 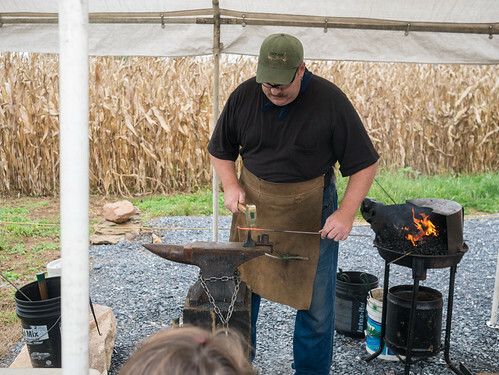 We then processed corn stalks, learned about grains, checked out where they milked cows, learned about making brooms, made some rope, and learned about bees (sorry, no pictures). Next, Molly used the corn sheller to remove all the kernels from this ear of corn, leaving her with only a cob. She took those kernels and put them in the grain mill to make cornmeal. After that, we headed into the farmhouse to see how they did laundry, cooked, and lived without electricity. The kids had a good time and learned a good bit, but it was an exhausting pace. I think all the parents breathed a sigh of relief when the kids got back on the bus to head back to school.